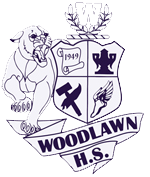 The JROTC program is a cooperative effort on the part of the Army and Woodlawn High School to provide secondary school students opportunities for total development. The JROTC learning experience is intended to be useful to students in any future career, military or civilian. Satisfactory completion of the program can also lead to advanced placement credit in Senior JROTC or advanced rank in the Active Army, Army Reserve, or the National Guard. Credit may be applied to the PE requirement or an as elective credit. Description: Presents the history, purpose, and objectives of the JROTC program. Introduction to leadership theory, drill, ceremonies, and first aid. Basic marksmanship with a .177 caliber precision air rifle which includes firing position, range practice, and record firing. Description: Discussion of management, elements of the leadership abilities in drill, ceremonies, intermediate first aid, and map reading. Description: Course consists of applied leadership techniques, practical leadership development, land navigation using intermediate map reading skills in a field environment. Marksmanship includes firing exercise, attributes of coaching, and coaching techniques. Description: This course is an extension of JROTC III and consists of advanced applied leadership techniques, practical leadership development, and advanced land navigation using applied map reading skills in a field environment. Marksmanship includes firing exercise, attributes of advanced coaching, and coaching techniques.